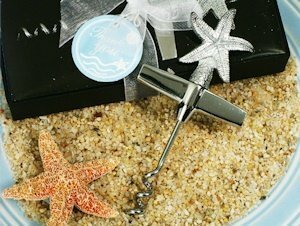 Thank your guests for sharing in your special day by presenting them with this beautiful starfish design bottle opener. Perfect for a seaside wedding or any beach themed event, this solid chrome bottle opener is topped with a detailed starfish and ready for gift giving. Each opener comes packaged in an elegant black gift box with velvet lining and wrapped with an organza ribbon. We've also attached a beach themed thank you tag. Each favor measures 4.75" x 2.